It was announced today that Biketographer has become one of many sponsors of the British Speedway team, the Wight Warriors. The Wight Warriors are based in the Isle of Wight, which is just off the south end of the main continent of the United Kingdom. Biketographer first learned of this relatively new Speedway team from Cobra’s Garage Mahal. Cobra began his support of the Wight Warriors in 2016. The home track for the Wight Warriors is Island Speedway just south of the village of Ryde. 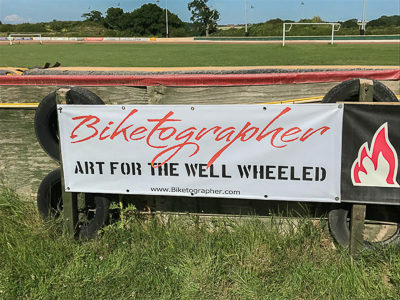 When you see video of the Wight Warriors in action at their home track, keep an eye out for the Biketographer banner! Biketographer is also on facebook. This entry was posted in About Biketographer, Motorcycle Shows & Events and tagged Speedway, Sponsor, United Kingdom. Bookmark the permalink.